I can be surprisingly conservative with my choice of cycling equipment; take for instance brakes. For a long time I have resisted the disc brakes. While it’s true that I have an mtb with mechanical discs, that configuration had more to do with searching for adequate braking for the road STI levers than a unwavering belief in discs. If cantilever brakes had been an option for the Rock Shox SID fork, I might not have walked down that path. But I did, and I have come to appreciate disc brakes. However, I really think that disc are best matched to hydraulic actuation systems. As far as road bikes are concerned, how long must we wait for an integrated shift/brake lever that uses hydraulic fluid rather than a brake cable? 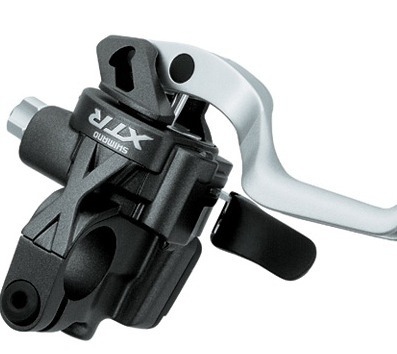 The obvious instigator would have to be Shimano, since they’re XTR M975 lever is so close in form to what a hydraulic roadbike STI would need to be. The difficulty in this is that racing drives component development, whether it be mtb or road. That means XTR gets a hydraulic integrated shifter and Dura Ace goes electric. A roadbike hydraulic STI would benefit the mid and high-end touring and roadbike commuter groups, and those groups aren’t lucrative enough to chase with expensive product development. Still, I’d think it would have to happen someday.